The Traveler. The Golden Age. The Darkness. I listen in cynical awe as Destiny tries to drown me. The living room is dark. My headphones ring of Halo overtones of the past. Humanity is judged. The Traveler offers redemption. Our bodies are frail. Dust. We are all destined to die. The writer of Hebrews talks about how following death comes judgement. One single decision. One choice. Keeps us from the forever darkness. I hear a voice that reminds me of the pissed-off elf-sized author from the film Elf! He identifies himself as Ghost. Apparently he has been searching for me for a long long time but never managed to check twitter or Facebook. Adjusting my headphones, Peter Dinklage breathes softly into my ear. My Titan rises after a century long dirt nap. Predators howl in the distance. Ghost tells me that we need to find shelter, fast. I don’t believe him. I can tell that Destiny is highly scripted. Nothing is going to happen to me. Silly Peter. The tired mind is rarely rational. The combination of music, lighting, and level design are making me tense. Did you hear that? I grip the controller tightly and venture on through some random ruins. Bad guys die. A spaceship is found. 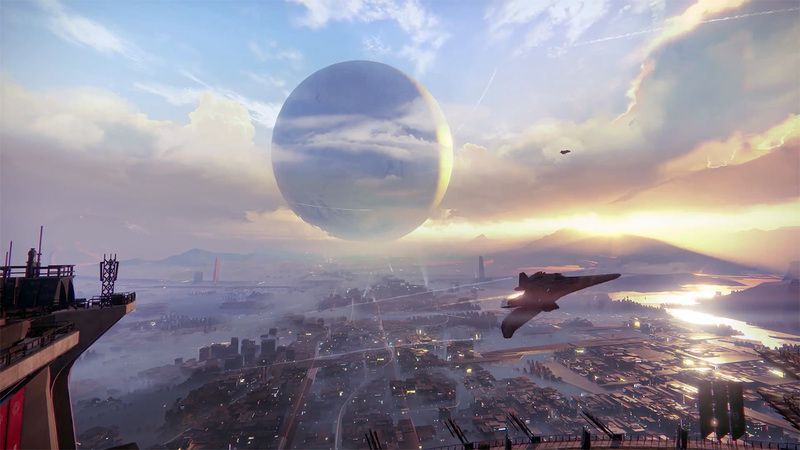 Ghost and I travel to the last city the Traveler can protect. My eyes burn. I am tired and want to go to sleep. However, the feedback loop has taken hold. I press on.